One of my goals, now that Carole is settled somewhere, is to see that area of the country in all its various seasons. I had been to Virginia in mid-May and in mid-August. We had traveled through, years ago, in mid-June. The other thing I have to incorporate into a trip is a get together with guild members who live out that way or who can get to Virginia. I decided to mesh these two things together over Memorial Day weekend. I could stay longer because I wasn't using up a lot of vacation time and people wouldn't have to dash off early because they have work the next day. Now toss in the release of the newest "Godzilla" movie and it's a complete package weekend. I'm a big Godzilla fan, but, and this is huge, I'm a fan of the original Godzilla, the guy in the rubber suit stomping around a balsa wood rendition of Tokyo. It really doesn't get any better than this for sheer camp. 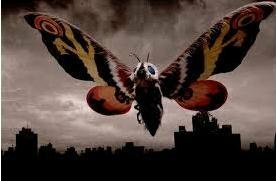 Add in a giant moth and you have the makings of a great night of cinematic unintentional silliness. Godzilla was all about the horrors of the nuclear age. All of the creatures he fought and, indeed himself, were designed to remind people that what we had unleashed with the bombing of Hiroshima and Nagasaki, could turn on us in an exceedingly violent fashion. That the movies became cult hits because they were quite bad was not the intention. There was another attempt at recreating the magic of Godzilla. Those of us who know the franchise and love it for what it is, were horrified by the 1998 movie starring Matthew Broderick and Jean Reno. The upright dinosaur we knew was replaced with a velicoraptor-like monster. 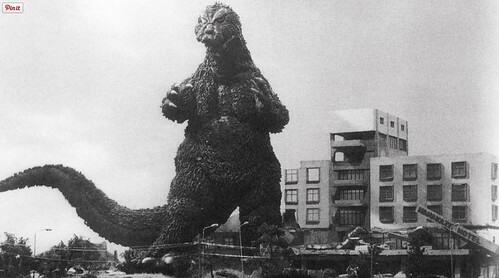 "That's not Godzilla! ", we all said and the movie flopped. So it takes a good 10 years to get a new Godzilla into development. I watch as the project goes through a couple of directors and some script writers. You're dealing with an icon here, folks. While you think it's about a guy in a rubber suit stepping on Tokyo, there has to be a reason, a meaning behind the actions, even if it's the most superfluous reason you can find. I wasn't expecting anything to come from the announcement of shooting starting on a new Godzilla movie. Then, in December of 2013, the first trailer showed up. Whoa. There isn't a guy in a rubber suit, but it's clearly not some creature that it shouldn't be. I started thinking about seeing this. I needed to pass judgement on this new movie. Was it "Godzilla" or some cheap knock off? Then the release date was announced and it was one week before Memorial Day. We could have a whole weekend of guild stuff! We'd go to the movie and then go out for dinner afterwards. The official guild party could be the next day. It was perfect. So, on Saturday, May 23rd, Skipkick and his lovely wife, Becky; Dorelei, her 2 children and her husband; Totorodoo (not in the photo. We couldn't find him after the movie. 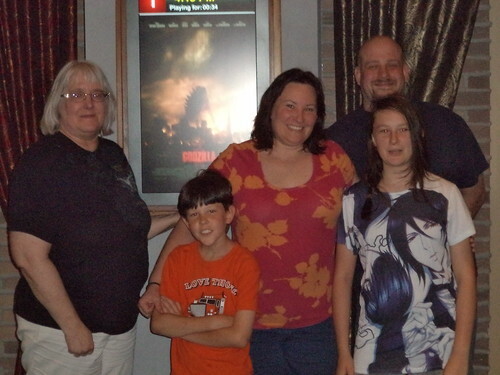 ); Carole, Larry and I went to see "Godzilla". Verdict? It was awesome! He's a bit too fat, like he's been lying on the sea floor eating too many fast food wrappers which drop from above, but the homage to the original is clearly evident in the creation of this version. I very much enjoyed that cities other than Tokyo were destroyed; Las Vegas, Honolulu and San Francisco. If you have not seen the movie, trust me when I say some of the loudest laughs were when Vegas takes monster damage. You don't go to something like this looking for an Oscar winning screenplay or Oscar worthy performances. Still, they got Bryan Cranston, Ken Watanabe, David Strathairn and Juliette Binoche to stand in front of green screens and look very, very serious. Those people did an exceptionally good job. They also didn't unleash Godzilla on us until about 45 minutes into the movie. That's a long time for the movie's namesake to be only discussed and never seen. You've come to see the monster. Where the heck is he? The 1998 movie tried the same tactic, but the overall effect was a disaster precisely because they chose not to show Godzilla in any trailer and because they had changed him. When this Godzilla arrives, it is the old one, the one we know, walking upright. We had also seen enough of him in trailers to know he was an homage to the original. And when he finally turned on the breath ray, a cheer went up from the audience. As a movie designed to make you think, this doesn't. Some of the acting is either over the top or they could have used a sock puppet to the same effect. There are plot holes bigger than the holes Godzilla puts in San Francisco's buildings. But there were twists I didn't see coming, things that made you realize the people involved in this Godzilla know, and, more importantly, love the original, even if their San Francisco is CGI and not balsa wood. Can't wait for it to come out on video.